At the Adamson Restaurant & Cocktail Bar, we are excited to launch our brand-new menu in July. Designed by our Head Chef Stewart Macaulay, we are featuring deliciously seasonal dishes, which are thoroughly of-the-moment, letting beautiful Summer ingredients shine. 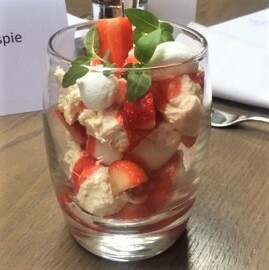 Tantalise your taste buds such as a decadent dessert of Eton mess: strawberries, Laurent-Perrier jelly, meringue and champagne sorbet. Book your table with us now to try our brand-new menu.